Last week, we had a 5-day holiday in Bangkok. As one of my favourite cities, I'd been wanting to return for ages; Bangkok is one of the most vibrant, energised and culturally fascinating places I've visited. This was our first Bangkok family holiday; az and I have visited many times over the years but of course, it's completely different with kids. We stayed in the "lively and eclectic Sala Daeng", about a 5 minute walk from the skytrain (or 10 minutes with a pram and small legs). If there's one piece of advice I'd give to someone staying in Bangkok, it's to pick accommodation near a (BTS) skytrain station. It's the fastest, most efficient and cheapest way to get around town. And with that lead in, here are 6 of my favourite things about Bangkok (in no particular order). Thai people have to be some of the most genuinely friendly, generous and helpful people I've met. Yeah, sure, you're always going to get people in a hurry, a bad mood or trying to rip you off. That happens everywhere. Though I don't recall it happening to us on our trip. As a general rule, the Thais are chilled out and happy. Strangers on the street stopped to ask if we need directions, and skytrain attendants ushered us in and out of the stations. People smile, they laugh with you, and it puts everyone in a good mood. And that's what you want on holiday. They love them. Much like our trip to Myanmar, the number of Thai people who squeezed our kids' cheeks, patted their heads, or tried to engage them in conversation was quite amazing. For some children, it's probably a bit off-putting but our two wallflowers revel in the attention. People stood up for us on trains; waiters served kid-friendly dishes that weren't on the menu; and even our taxi driver was turning round to smile at the kids while driving. Okay, so that last one was perhaps less encouraging but you get the picture. As a parent travelling with small children, it helps to know that the general public view your kids favourably, especially when they're throwing a tanty in the shopping mall. Bangkok is one of those Asian cities that's developed to the extent that you can buy just about anything and its public transport skytrain system is world class. But unlike many cities whose cultural identity has been engulfed by modernity, Bangkok has not only kept its street life culture but made it a signature asset. Down a Bangkok alleyway, we found this colourfully festooned tree, half supporting, half intertwined with a building. Maybe it's decorated for Pi Mai (new year) or maybe just because it's an awesome tree. One evening, we found the streets around Sala Daeng station blocked off for a night street market. There were music and dancing performances, markets, and of course, stall after stall of street food. It was packed full of locals and tourists alike. In Australia, this kind of event would take months of planning and advertising. In Bangkok, it's a nightly occurrence. Bangkok shopping is second to none. By shopping, I don't just mean international clothes and shoe stores, though there's certainly those too. Bangkok is full of shopping malls; I marvel that they stay in business but the Thais love shopping. The awesome part of the shopping is the incredible range available, from luxury labels to original, eclectic designs at bargain prices. If you love air-conditioned malls, there's no shortage. Or if you prefer the rabbit warren of open markets, you'll be in heaven, one the best being the phenomenal Chatuchak weekend market. In every Bangkok shopping locale, you'll find a staggering range of new and different designs. Nobody does cutesy and cool quite like the Thais. There's nothing you can't buy and in every colour and style you can imagine. There's so much more to Bangkok than (or as well as) shopping. From cultural shows to river cruises and visits to museums and galleries, you could spend weeks in Bangkok and not see all the highlights. We preferred to skip most of the cultural stuff and stick to shopping, walking around and, of course, eating (see #6). 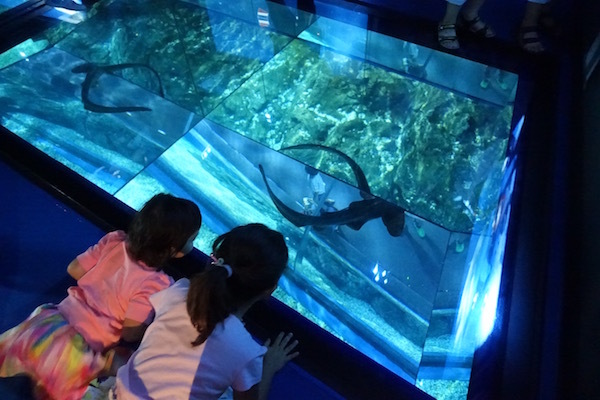 A few places we did visit that were particularly kid-friendly were the aquarium at Siam Paragon and Kidzania. My advice visiting Sea Life in Bangkok is buy tickets online and get there early, ie at 10am sharp when they open. Or you'll get stuck in really long, shuffling queues, like an hour long, or more. Sea Life was probably the family favourite in Bangkok. As well, arriving early meant there was hardly anyone there and we got the massive floor-to-ceiling displays to ourselves (and the sharks). The kids spent hours play acting as pilots, doctors, vets and particularly, beauticians, at Kidzania Bangkok. And last but naturally not least, the food in Bangkok is amazing. The choice, the quality and the price are all fantastic value - what more can you ask for, really? There's streetfood on every corner in Bangkok, especially around and inside the BTS stations. At the night market I mentioned above there were at least 100 food stalls and I walked for blocks simply trying to capture the breadth of them. Then there's the range of fresh food at the supermarkets - especially the fruit, dairy and freshly prepared curries, soups and noodles. Okay, so coming from the minimarts of Vientiane, Thai supermarkets are pretty darn exciting. And who doesn't love wandering around foreign supermarkets anyway? Organic milk! Fresh mango juice! Sashimi tuna! Hot, homecooked noodle soup with prawns and veggies! Yet another options are the food courts in the malls, and I'm not talking about fast food McDonalds or the pay by top-up card places (though they're there as well). I mean the award-winning restaurants that have opened mini restaurants inside the food courts and are doing a roaring trade. For us that meant a beeline to Japanese food and primarily, sushi. Korean bulgolgi, ramen noodles and Mexican quesadillas also got a look in. And of course, there's dessert. In fact, there are cafes that only serve dessert - what a great idea! - like the popular After You cafe. I bought this chocolate Mars cake there (and ate it after the kids were in bed). Oh my, it was good.